When you say that Randy Clemens wrote the book on Sriracha that’s both figuratively and literally true. Randy has authored two books on Sriracha. The first, still in print and selling well, is the Sriracha Cookbook. Just released from Ten Speed Press is Clemens’ latest, The Veggie-Lover’s Sriracha Cookbook : 50 Vegan “Rooster Sauce: Recipes that Pack a Punch. On Randy’s Web site he graciously shares favorite recipes from each book. Look for Honey Glazed Sriracha Buffalo Wings and Watermelon-Sriracha Sangria. Griffin Hammond is a video producer at YouTube Next Lab where he manages Indy Mogul. This You Tube channel teaches low-budget filmmaking techniques to over 500,000 subscribers. Griffin was intrigued with the story of Sriracha and Vietnam refugee David Tran the founder of Huy Fong Foods who developed the ubiquitous American brand with the familiar Red Rooster on the distinctive plastic bottle with the green cap. Hammond felt compelled to make a 30-minute documentary revealing the story of Sriracha – where it comes from – how it’s made, and the people who love it. It’s the Sriracha wars and the heat is on ! If you think Sriracha is simply the locally produced, fiery sauce with the red rooster on the label you need to know the real story. It’s actually Thai hot sauce named after the seaside town of Si Racha. It’s as popular as ketchup on the Southeast Asian table. Documentary filmmaker Griffin Hammond will join us to talk about the Sriracha documentary he’s working on. It’s partially funded by an ongoing KickStarter campaign that’s already oversubscribed! He’ll be joined by local food writer Randy Clemens who is the author of two cookbooks on Sriracha. Newly released is The Veggie-Lover’s Sriracha Cookbook from Ten Speed Press. Our favorite all-star, “Ask a Mexican,” Gustavo Arellano, returns to give us more practical insight on Mexican ingredients and their history. He’s also the editor of OC Weekly. Chef Evan Funke generated a lot of interest at Rustic Canyon as the opening chef when it opened a few years back in Santa Monica. Now Evan is about to debut Bucato Restaurant on Washington Blvd. in Culver City in the former iconic Beacon Laundry Building which is part of the larger Helms Bakery complex. With Bucato he is Executive Chef and Proprietor. During construction Chef Evan has been operating a food truck. The rave item is his porchetta sandwich. Bucato will be modern Italian. Valerie Confections latest project is their new Coffee Shop & Bakery located at the historic Grand Central Market in Downtown Los Angeles. Chef Marcus just got off a plane flight to Chicago before going on the air with us and we’re most grateful to him for extending himself to be available for this interview. Last year Marcus Samuelsson published his inspiring memoir, Yes, Chef: A Memoir. He’s in his early 40s so to have enough of substance to share with readers at this youthful age is pretty special. Readers of the book will quickly realize that he’s lived a couple of lifetimes already and there is surely lots more of substance in his future. The book is brutally honest about the “left turns” on Chef Marcus’ path to the runaway success he is today. All of that life experience has made him an even stronger person. Marcus feels you learn more from your mistakes if you really take them to heart. Marcus attributes the women in his life to providing him the most inspiration. These ladies include his late Ethiopian birth mother, his Swedish mother (by adoption,) and his Swedish grandmother who encouraged his early interest in cooking. Earlier this month at a black-tie ceremony at Lincoln Center in New York Yes, Chef was awarded the James Beard Award for “Writing and Literature”. Congratulations to Marcus Samuelsson! The paperback edition of Yes, Chef from Random House Trade Paperbacks has just been released. For all aspiring young culinarians this book is a graduate degree in what it really takes to learn the craft and the dues you need to pay along the way. Special treat for this Saturday’s show. 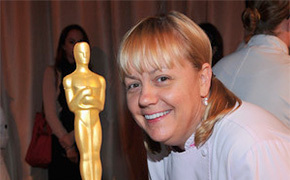 Pastry princess Sherry Yard is guest hosting the “SoCal Restaurant Show.” She was Wolfgang Puck’s long-time pastry chef until departing after the Oscars this year to embark on a restaurant project of her own. Sherry Yard is a multiple James Beard Award-winner for both the pastry arts as well as writing. These coveted medallions are the Oscars of the food world! Sherry was just in New York for the annual Beard Awards presented at Lincoln Center. Sherry will tell us what it’s like to be backstage and onstage in Manhattan during the Beard Awards. 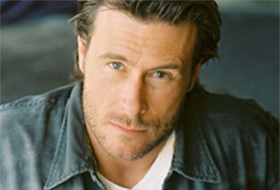 Craig Strong is the executive chef of Studio at Montage Laguna Beach. This is one of Orange County’s elite fine-dining destinations. It’s housed in its own architecturally distinctive building on the luscious grounds of Montage and the added bonus is the view of The Pacific. On Sunday, June 3rd Chef Strong and his team are again hosting the annual Share Our Strength – Taste of the Nation benefit in Studio and the adjacent grounds. It’s a refined walk-around wine and food tasting afternoon with incredible tastes from some of the most high profile chefs in the country. Alan Wong from Alan Wong’s in Honolulu is one of the distinguished visiting chefs. Chef Alan cooks for the President at Alan Wong’s when he visits Honolulu. Also Chef Brooke Williamson of Hudson House in Redondo Beach. She was the runner- up in this season’s “Top Chef” series on Bravo! Saxophonist Bill Esparza has been dubbed the “Mexican Food Maestro.” As a hobby he’s developed an expertise (now a bustling 2nd career) in the foods of Baja California and the other culinary regions of Mexico. He leads escorted food tours there for journalists and food fans alike. He’s even given advice to Travel Channel’s Andrew Zimmern. On Sunday, June 23rd he’s hosting LA Weekly’s Tacolandia Tacofest from Noon to 5:00 p.m. on the parking lot of the Hollywood Palladium. When a group of accomplished French chefs get together to cook guaranteed fun is always on the menu. The 33rd Annual Picnic des Chefs will be held on Sunday, June 2, 2013 at Vasa Park in Agoura Hills. This picnic is organized annually by the Club Culinaire of Southern California to benefit area charities. On hand will be food tasting stations from 20 area restaurants complimented by premium wines from 20 wineries. Chef Martin Blin the executive chef of Sofitel Los Angeles (across from the Beverly Center) and the President of the group joins us with all the appetizing details. Back to our conversation with Sherry Yard. Her new venture is the reimagined Helms Bakery (under construction) in partnership with Sang Yoon of Father’s Office and Lukshon. This will be on the site of the original Helms Bakery, an iconic food landmark and brand established in 1931 (with home delivery) which sadly closed in 1969. Marcus Samuelsson of Red Rooster and Ginny’s Supper Club in Harlem really needs no introduction. Among his many achievements he orchestrated the menu for President Obama’s first State Dinner at the White House during his initial term. His excellent memoirs, Yes, Chef, is now in paperback. It just earned a James Beard Award. It’s a must read for any young person contemplating a career in the culinary arts. Chef Marcus is brutally honest in recounting his achievements and failures on the lengthy path to the major success he now is. Chef Govind Armstrong started his culinary career in Los Angeles early with Wolfgang Puck at the tender age of 13. Before Post & Beam he was best known for Table 8 on Melrose Avenue. 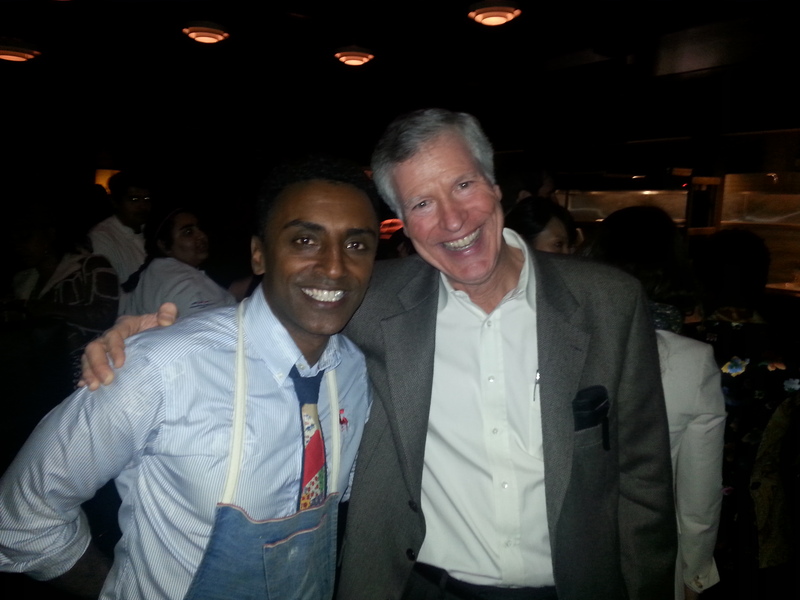 Govind is friends with super chef Marcus Samuelsson of Red Rooster and Ginny’s Supper Club fame in Harlem. They originally met at the Aspen Food & Wine Classic. Marcus even mentioned Chef Govind in his well-received memoir (published last year,) Yes, Chef. There is a modest donation of $20 for admission to the After Party with a DJ and a cash bar. All the money goes to benefit C-CAP. This is a ticketed event. Chef Marcus is on the National Board of Directors in New York for the Careers Through Culinary Arts Program, and has been a generous benefactor of the effort. C-CAP provides culinary education in high schools for at-risk and disadvantaged students thinking about careers in the culinary arts. As seniors, if the culinary arts becomes a true career direction, there is a generous scholarship program where the best of the best are identified in a series of competitions and are awarded scholarships to the top line culinary arts universities in the country. 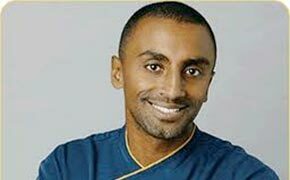 Marcus Samuelsson is going to be at Post & Beam in Baldwin Hills on Tuesday evening, February 26th cooking with host chef Govind Armstrong at a dinner to benefit C-CAP. It’s a “Taste of Harlem” saluting Black History Month. The menu is reimagined soul classics. The dinner itself is sold out but an After Party with a DJ is being organized. Check with Post & Bream at 323.299.5599 for the details. It also benefits C-CAP.